If you grew up in the late-1980s or 1990s, chances are you had some toys produced by Russ, or at least saw them regularly at the store. Russ was a brand of Russ Berrie and Company, which made a variety of small toys--among other items--that were sold at gift stores, pharmacies, candy stores and other outlets. Their products were often based around specific holidays (for example, Christmas stocking and Easter basket stuffers). 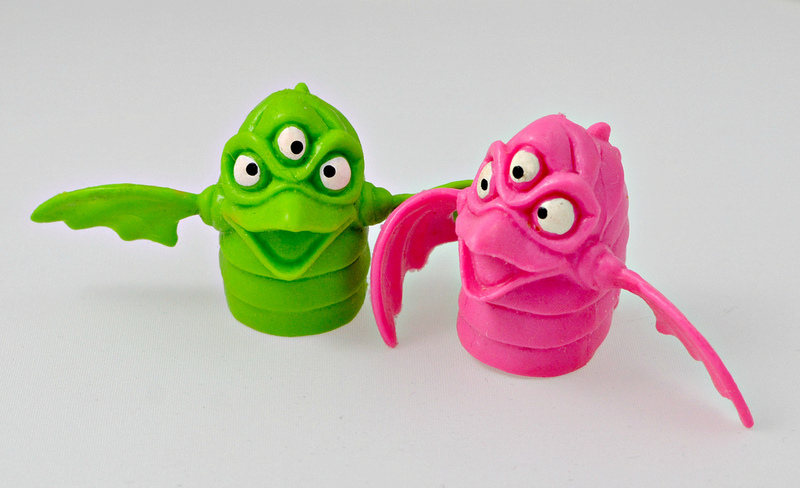 In my opinion, the coolest toys Russ released were their monster finger puppets, which could be found most frequently in the first half of the '90s. Russ sold a lot of these things during that time. 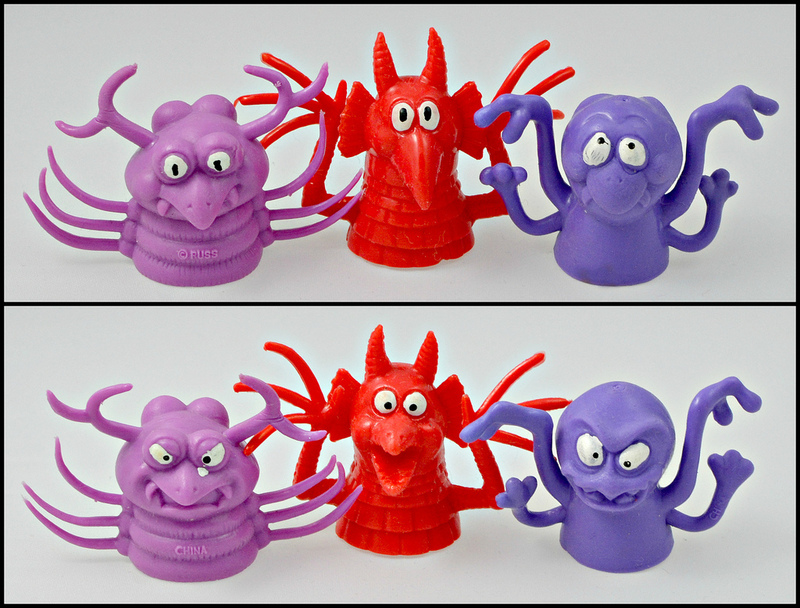 There were glow in the dark ones, versions meant to sit on top of pencils, and "two-faced" ones, which had a different expression on their front and back sides. All of them are made of soft rubber and feature some painted details. Some of these finger puppets were also offered as pack-in giveaways with Babybel cheese. 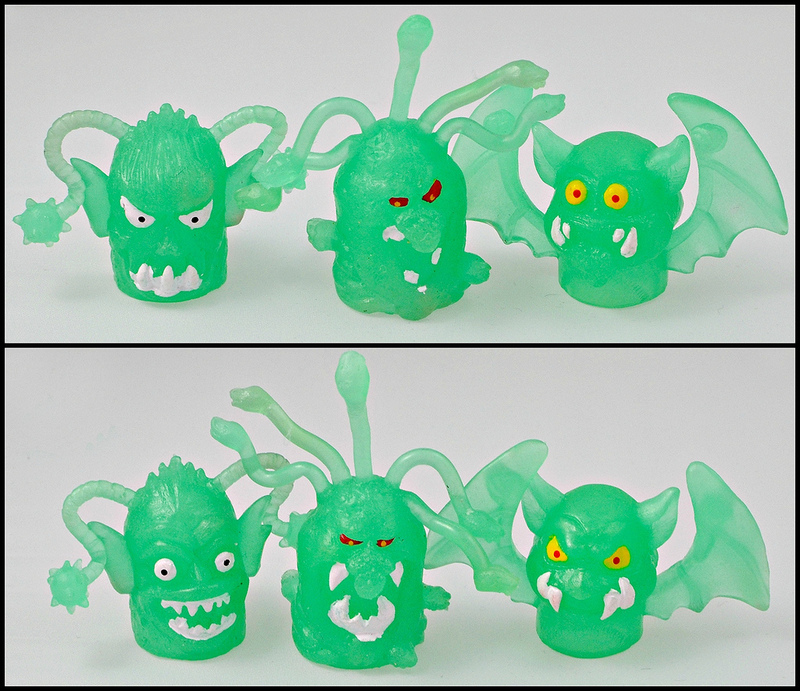 I can still remember going through the little nets filled with cheese wheels at the grocery store, looking for the coolest monsters. 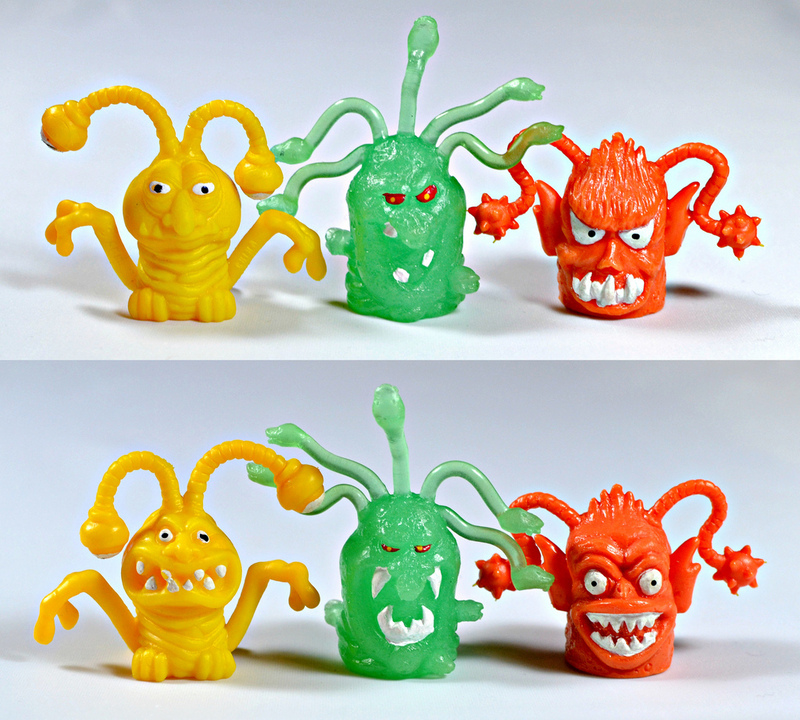 Below is a look at various types of Russ finger monsters. Do you remember any of these? Do/did you have any yourself? Had a fair few of these over the years, the dinosaur ones being my favourite - still got them all in a bucket at the bottom of my cupboard! Love the look of that fish-lipped bat-winged one. Think I've got one you haven't got, a more obviously "fish" styled one. Yeah, I always liked the two-headed dino especially. I vaguely remember seeing a fish-like one in the store. 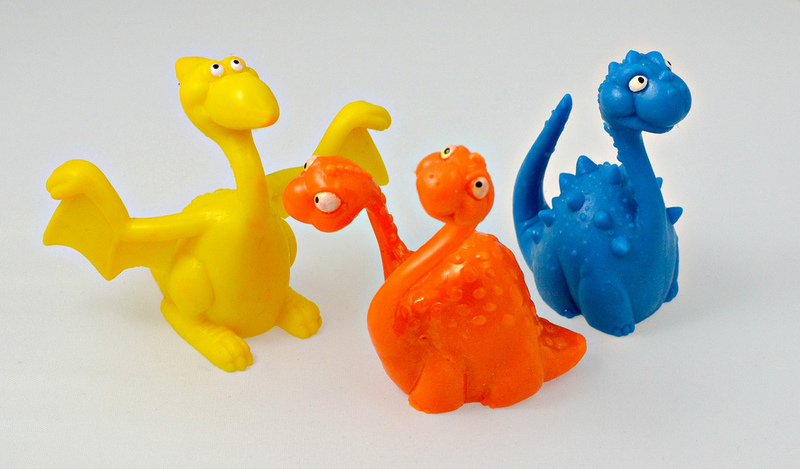 Oh my gosh, those dinosaurs! I remember I used to have those! The two-headed long-neck stands out in my mind, but I never knew where we got them. All our dinos are long since gone, but maybe now I can better track down another two-headed dino! Thank you, these guys are great! Glad I could trigger the memory. 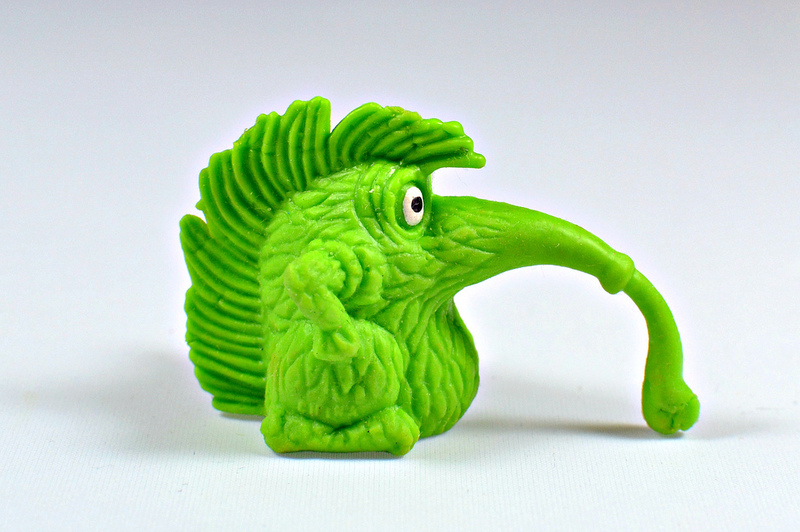 ;) I haven't tried searching for any of these on eBay, but I'd imagine you'd probably have luck just searching for dinosaur finger puppet. I've been trying to look up these things,but was having no luck. 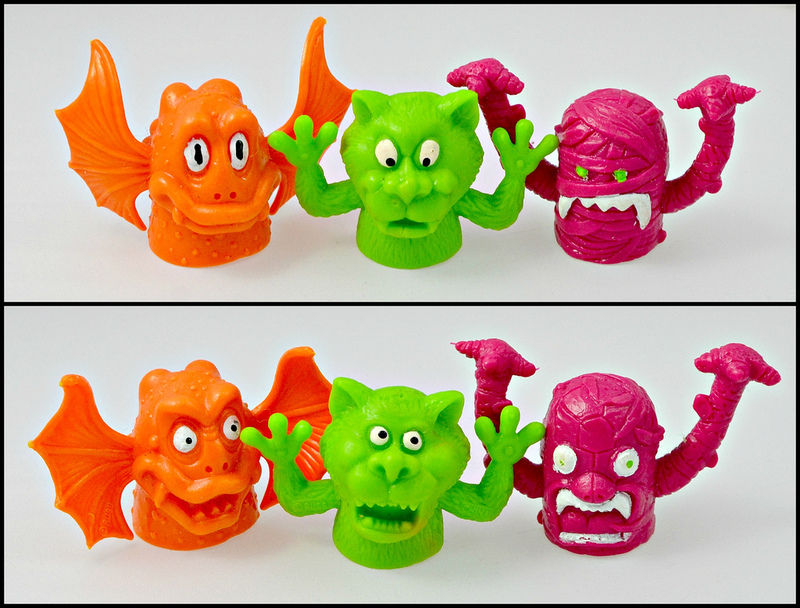 Thanks for posting,I used to collect the two faced monsters and I know I had at least that one dinosaur. Thanks for commenting--glad you found the post helpful! I couldn't find much online about these, either. I had the two headed dinosaur and have been looking for it ever since. Is there a place you can buy these?